Week 7! How did I get here! And running for 20 minutes! I’d been dreading this ever since I peeked ahead after my last run the previous week. 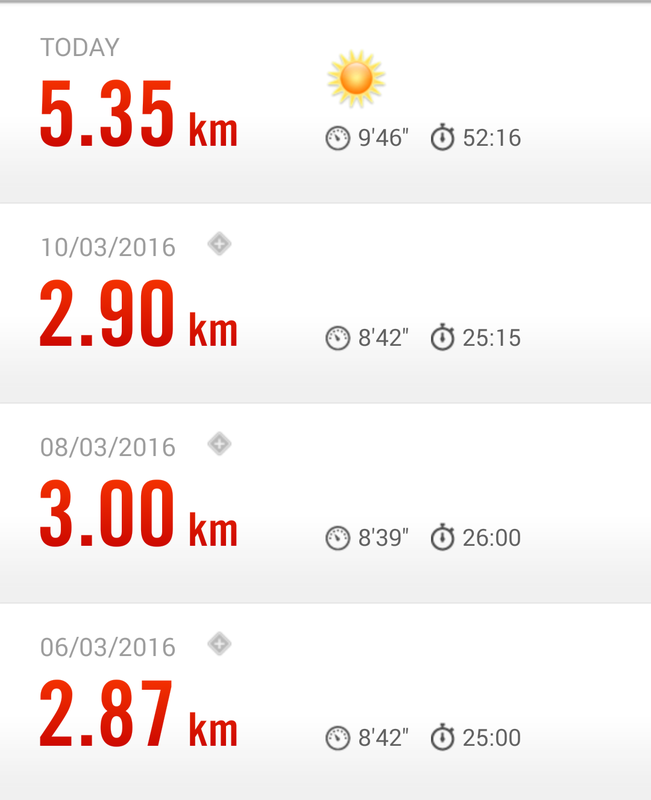 I warmed up at 6 km/h and began running at 7.2 km/h. I made it to 10 minutes and took the speed down to 6.8 km/h for 20-30 seconds, and once I did that I found it hard to take the speed back up again. In the second half I carried on at 7.2 km/h but reduced the speed for 15 seconds three times in those last 10 minutes. And when I got to 25 minutes, I hit the big red ‘Stop’ button instead of the ‘Cool down’ button, which was annoying! So I restarted the treadmill and walked at an easy pace for a few minutes… I have a feeling I’m going to be repeating this week because I found it soooo hard! On Sunday evening I decided to try a Vinyasa Flow class at Eco Yoga Sanctuary. The teacher is great – she said each person could go at their own place and rest at any point during the class. It wasn’t easy, and I was the sweatiest person there by the end of the class, but I enjoyed it. I think she is fast becoming my favourite teacher at the yoga studio. I had a session with Pete on Monday. He asked what I’d done over the weekend in terms of exercise, and I told him I’d done something every day. He said that I wouldn’t be doing any running at all in the session – and to warm up I did 10 minutes on the treadmill followed by some thorough stretching. I had to keep my core engaged throughout those exercises – I relaxed at one point during the combined lunge/knee raise and almost fell over. I say ‘reverse wood chopper’ because I can’t remember the real name of the exercise. Holding the kettlebell at my right hip with both hands, I’d have to lift the kettlebell diagonally across my body so that I ended up holding it above the left side of my body. Does that make sense? I did all that in 5:30. So by the end of the session, I’d done 116 squats. Would I be able to walk the next day?? I did some stretches and was done for the day. I was a little sore on Tuesday but I went to the gym to do Week 7 Day 2 of the 10k Runner app. It was exactly the same as Day 1: warmup for 5 minutes, run for 20 minutes, cool down for 5 minutes. And again, I really struggled. I did the first 10 minutes at 7.2 km/h and in the second half of the run I kept reducing the speed for short periods of time. That afternoon I went to a Hatha Yoga class at Eco Yoga Sanctuary. That afternoon, I’d suddenly developed a sharp pain in my shin, just above my ankle, and I wasn’t sure what was causing it. I thought it might have been the sandals I was wearing for lunch, but I really don’t know what it was. After yoga I went home and just took it easy for the rest of the day. For the single leg pushup, I did these at an incline, not on the floor. I leaned on the bars of the chest press machine, raised one leg and did six pushups, then raised the other leg and did six more pushups. For the hammer curls, in the second set Pete reduced the weight to 5-lb dumbbells because I found the 3-kg weights too heavy. In the third set, I did six reps with the 3-kg weights and then Pete handed me the 5-lb dumbbells. But by that stage, even the 5-lb dumbbells seemed so heavy! And then I did some stretches and went home. It was only Wednesday and I’d already done four gym sessions and two yoga classes. I was on a roll! I went to the gym on Thursday, but when I got there the thought of running for a prolonged period of time made me want to weep. I decided I was going to have to redo Week 7 anyway so decided I’d alternate walking and running on the treadmill for 20 minutes. After a 5-minute warmup I alternated 1-2 minutes of running with 30-60 seconds of walking for 20 minutes, depending on how I was feeling. I ended with a 5-minute cool down. So at least I’d done something! I didn’t work out on Friday and on Saturday I went to the beach for a walk. My friend couldn’t make it so it was just me – and I went earlier than the week before, at about 6pm. Low point of the week? I’ve noticed that after my walks at the beach, my knees start to ache. I don’t know whether it’s the surface of the running track or whether I should slow down a bit, but my knees ache for a couple of days afterwards. High point of the week? Doing eight workouts this week, including the walk on the beach. I met some friends on Thursday and one of them told me I was looking ‘particularly skinny’ these days. I can tell you for a fact that I’m nowhere near skinny – and after thinking about it, I don’t really want to be skinny, just stronger and more toned. Weight loss? I stayed fairly constant this week, apart from a huge drop on Friday morning! 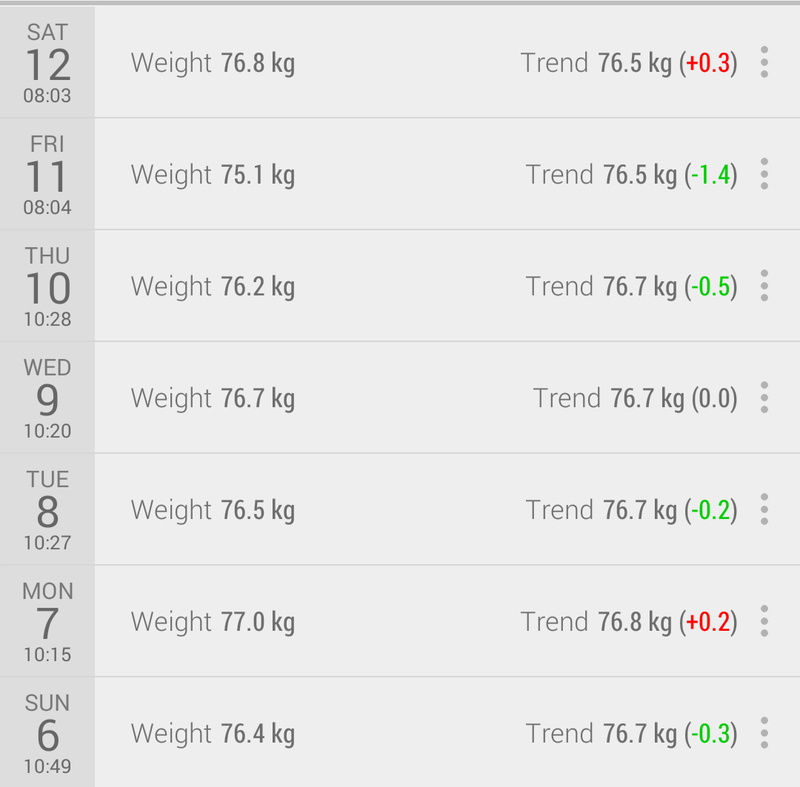 The Libra weight-tracking app now tells me I’ll hit my goal weight of 65 kg by the December this year. That seems doable, doesn’t it?